Remember the Art Academy learning game I talked about a few weeks ago? See the previous post here. I wanted to give you a quick update and show you how fast our daughter has enhanced her skills, it is pretty neat to see how much art exploring she has been able to do. I'm impressed by how it teaches art skills like drawing a foundational sketch before you paint and how to layer colors. I took these shots throughout the last few weeks on my phone while we were in the car. It has been such a fantastic car and running the errands activity for her, that she doesn't get bored with. Who else has played around with Art Academy? that is way cool! 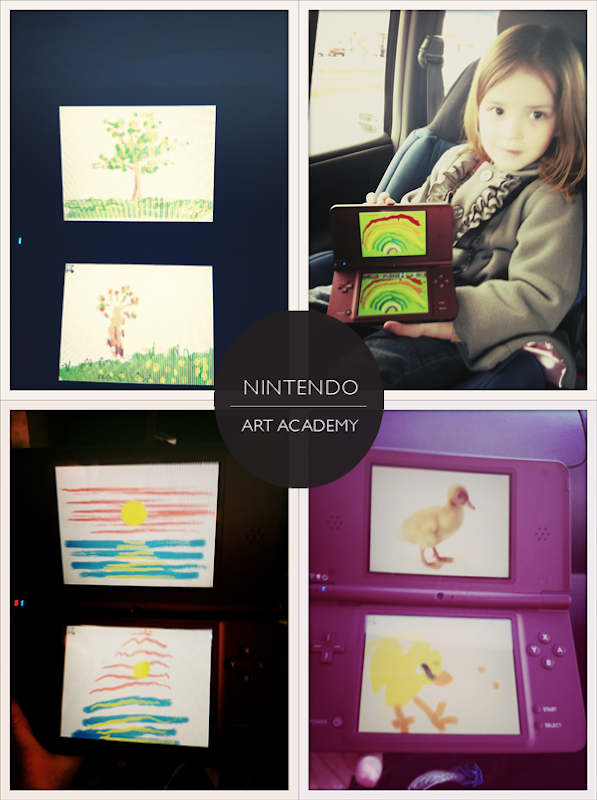 my kiddos got dsi's for christmas and my 7 year old budding artist might just LOVE this. thanks. Haha! That thing is Great! Vienna is such an artist!